Can't find a PoE switch for your Passive PoE equipped APs? Can’t get 100 meter of cabling distance? 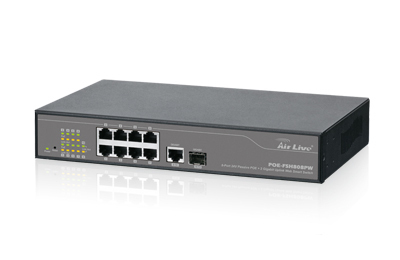 The AirLive PoE-FSH808PW is about to change everything. It is the industry’s first 24V Passive PoE switch with full power internal power supply and rack mountable. It consists of 8 10/100Mbps RJ-45 ports and 1 Gigabit RJ-45 plus 1 Gigabit SFP Port. The 8 10/100Mbps RJ-45 ports are built with 24V Passive PoE technology and data transmission over a single Ethernet cable, it is the ideal distribution switch for AirLive’s Wireless solution. With the Passive POE function, the POE-FSH808PW can power AirLive’s passive POE CPE or AP without additional power adapter. Moreover, it provides a remote management function for enabling/disabling the POE power output. POE-FSH808PW also provides other useful network management functions, such as port based VLAN, Tag VLAN, Bandwidth Control, Trunking, and Broadcast Storm Control. For Wireless Hotspot or WISP system, POE-FSH808PW helps the installer not only to establish the network easier, but to design the network more flexible and secure.